There’s nothing like having a big desk to work on. Sort of like having the corner office, although with a big desk you get more work done. I’m not sure the same holds true for the corner office. Since we now shoot in 4k, we got a 4k monitor. But I use it mostly as a computer screen. With a 42-inch, 3840×2160 pixel desktop, I can really spread out my work, even when jumping between Premiere Pro, Photoshop and AfterEffects. 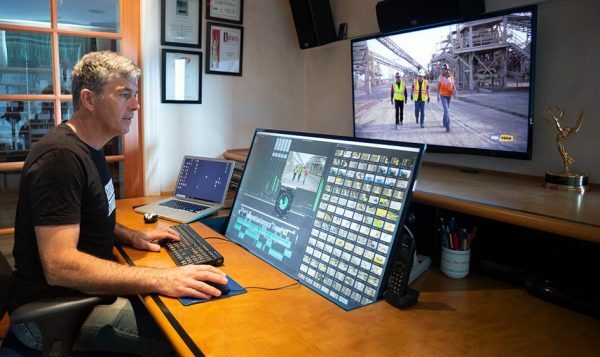 What a difference in productivity from the days when I worked with two monitors which showed me 1280×480 pixels combined and I had to put up with a huge bezel in the middle! eIMAGE edit suite with a 43″ 4k computer monitor. There was one drawback: the monitor is so huge I was craning my neck to look at the top of the screen. And it blocked my view of the program monitor. The solution was to cut into my work desk and sink the monitor down by 5½ inches. Now all the sightlines work perfectly and I’m a happy, productive video editor. 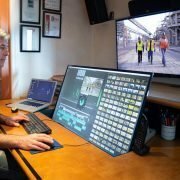 Nice information on 4K Monitor. Anyone can feel comfortable to work on this type of computer since it supports Premiere Pro, Photoshop and After Effects. Really helpful for working professionals. Thanks for sharing valuable information.